Google Sky Map Android app has been updated. 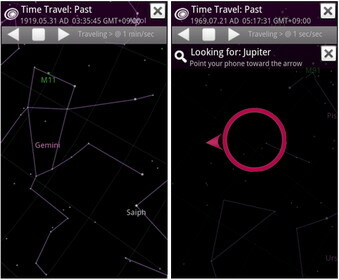 The new version of Google Sky Map lets you time travel to see the sky at a specific date, past or future. After smooth travel to the desired year, you can fast forward or rewind in various speeds and watch how the sky changes. You can already download this new version by going to Android Market on your phone. Google Sky Map is available for Android-powered devices running Android 1.6 and above. 0 comments on "Google Sky Map for Android adds time travel"